When you're shopping for top hoverboards, it's important to make sure you find the safest hoverboard on the market today. There are a number of aspects to pay attention to when you're looking for the set of wheels that is right for you. The right hoverboard will help you to stand out while offering a great price and a high level of safety. For some, this may even include a great speaker system to enjoy as you travel. In this article, you'll find several different hoverboards with these kinds of features and more so that you can find the perfect option to suit your needs. Here, you'll find excellent options for adults and children alike, as well as those tailored to speed, battery life and more. When you're looking for the perfect hoverboard, you'll want to keep in mind how long the trips are that you'll need to make, the weight of anyone riding it and the speed that is offered. 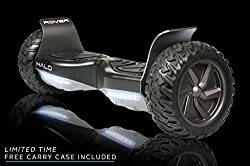 Many hoverboards will have either a mile or time limit on the battery that can give you a good idea of how far you'll be able to ride it before it needs a recharge. The weight limit can also help the device to last longer as long as the limit is adhered to. There are many who are familiar with Razor as a company due to their ubiquitous manual scooters. Over time, they have evolved into creating excellent hoverboards as well. One such example is the Razor Hovertrax 2.0, which is great for cruising around at eight miles each hour while keeping you balanced the whole way. One point to another, much like the company's earlier manual scooters were able to do. Unlike those older models, the Hovertrax 2.0 is able to propel you wherever you need, giving you a smoother ride than other options. This hoverboard is a fun choice for just about any age and is held up to UL2272 safety standards so that you can trust that there won't be a fire. The Razor Hovertrax 2.0 is designed with two riding modes to help new learners, made up of a training mode to help you learn while keeping you safe and a normal cruising mode for those who are used to the machine. Furthermore, it's made with 350-watt dual hub motors, fender bumpers and LED light bars to help you see where you're going. The LED battery-life monitor on the Razor Hovertrax 2.0 will also help you to keep track of the remaining life so that you can make sure the machine gets recharged as needed. In addition, reviewers have loved the safety and moving speed that the Razor Hovertrax 2.0 has to offer. It's a fantastic vehicle whether you're propelling around the street or in your house. The auto-level will help you to stay balanced on the hoverboard while you spend a good while riding around and having a wonderful, safe time. If you decide to try out this hoverboard, it's a good idea to watch and make sure it's able to hold a charge, that way any problems can be resolved before the warranty/return period is up. Furthermore, make sure to contact customer service as quickly as possible if you find that it isn't turning on. In some cases there have been problems with it being able to hold a charge. Some customers find that it ceases to turn on after just a few months of ownership. This is a fantastic go-to option if you're looking for the best possible hoverboard. Furthermore, it's self-balancing, offers a long battery life and is able to move quickly. This Koo Hoverboard is the least expensive hoverboard option in this list. However, don't worry that the lower cost might mean lower safety standards because this hoverboard is still able to meet the UL 2272 safety standards, so you'll be perfectly safe while using it. It's a fantastic beginner option that gets the job done, allowing you to cruise along at six miles per hour. The Koo Hoverboard only weighs about 22 pounds, so it's light and easy to carry when you're not riding it. In contrast, it's also able to handle users at a maximum weight of 220 pounds which goes to show that it's a very durable device. Because it is a budget hoverboard, it's not going to come with a lot of the intense features you might find in more expensive options but the unit still has a lot to offer. With a great look and a fantastic Bluetooth speaker, you can enjoy playing music with the machine paired to your phone. This is truly the coolest feature that the Koo hoverboard has to offer, allowing you to rock out while you're hovering along. You'll also be able to trust that this device can travel up inclines that are up to around 15 degrees. Therefore, if you're looking for an inexpensive first hoverboard purchase, the Koo hoverboard is a great way to go. It has a lot of fantastic reviews, showing that the majority of reviewers have been very happy with this hoverboard. The charger included for this hoverboard can sometimes be more fragile than other options, so make sure to keep an eye on it and get a replacement if needed. In other circumstances, you might find that only one side is working. Comes with clear use instructions. On some occasions, users may find that only one side works properly. The charger can sometimes break. When you're looking for a fantastic hoverboard at a budget-friendly price then the Koo is a great way to go. For the fastest hoverboard on today's market, look for the EPIKGO Sports Plus. While many other hoverboards travel at a max of about 10MPH, you can really fly on the EPIKGO Sports Plus at 12 miles per hour. It's able to do this because of the powerful 400-watt dual engines that can move you at intense speeds. You'll also be able to travel a solid 12 miles of distance on a single charge. The high-tread style of tires also help to keep the user safe and balanced as you travel on the EPIKGO Sports Plus. Do keep in mind that with this speed, you'll need to be extra careful if you travel near cars, pedestrians or bikes so that you and others can stay safe. This device also has a great design. Consequently, it's definitely a great choice for those who want to travel quickly and in style. It's also a fantastic option for those who want to be able to make quick trips without having to get in their car or call and Uber. Like many modern units, the EPIKGO Sports Plus is held up to UL 2272 safety standards to ensure there won't be any major problems due to the device itself. Overall, if you're looking for a fast, reliable unit then the EPIKGO Sports Plus is the model for you. This hoverboard can take longer to charge than other options, so make sure that you have time to wait in between your rides so that it can recharge fully. In addition, it is a more expensive option than others. It can be on the expensive side. Charging time can be longer than other options. For those who feel the need to move quickly, this is definitely the best option when it comes to the speed you crave. When hoverboards first came onto the market, there was a bit of controversy with regard to some of the units catching fire. Naturally, the makers of these products don't want to sell something that could potentially be dangerous to the buyer. Because of that, newer models like the EPIKGO All-Terrain were made using UL 2272 specifications that create more safety for the users. Because of the 400-watt dual motors on this unit, it has the ability to ride through all kinds of terrain safely, which means that things like dirt, puddles, sand and grass won't be a problem. With a single charge, the EPIKGO All-Terrain Scooter will be able to to give you around an hour of use or 10 miles of travel. Using wheels that are 30 percent larger than what you'll find on the average hoverboard, it's able to handle terrain and offer a higher level of safety. The safety protocols included in the making of this hoverboard make it much less prone to issues like catching fire than earlier models. This is especially important because many younger people are interested in these hoverboards and these models work to keep them safe as they ride. 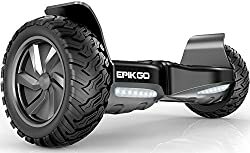 On top of that, the EPIKGO All-Terrain Scooter ups the safety game by not only being resistant to fire, but is also water resistant and able to level itself to handle up to 18-degree slopes. The great features on this hoverboard are sure to make your ride much more enjoyable. Therefore, if you're looking for a model with a high level of safety as well as a long-lasting battery then this is a great option. While it is going to be a few hundred dollars more expensive than a more basic unit, it's a device that has the added feat of self balancing and the ability to travel through multiple terrains. While many have used and loved this hoverboard, there have been a handful of instances when it has broken in half while lighter users have been on it. Simple to learn to use. Runs well on multiple terrain types. On rare occasions, it can break in half even while lighter users are on it. The charger may stop working properly. If you're interested in being able to easily ride through multiple kinds of terrains, then this is a safe, easy to use option. Shopping for a hoverboard for kids can often result in finding a lot of toy units. While these may seem appealing and perhaps less expensive, buying them can lead to a large number of safety issues. On the other hand, if you want something that will be safe and more likely to last, the Halo Rover Hoverboard is your answer. Furthermore, this versatile unit is great for kids and can give parents peace of mind in knowing they're safe. The Halo Rover Hoverboard is made to the latest safety standards and offers three riding modes for those who are advanced, normal and just learning to use it. It's also going to be able to travel through lots of terrain easily, including sand, grass and dirt. 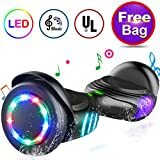 Kids will also love this board and its ability to play music through speakers on the Halo through the use of a Bluetooth app their phone can connect to. Overall, it's a great unit that can function well for a child or teenager until they are ready to move up to something with faster speeds. The Halo Rover Hoverboard is easy to learn, and satisfying in that it doesn't have the appearance of a kid's toy. 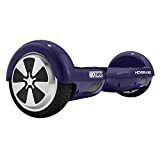 In addition, this hoverboard has gotten a lot of praise from Amazon reviewers who are happy with the model, saying that it's easy to get the hang of. If you want a great learning hoverboard, get this model and you'll be moving in no time. In some cases, customers do find that the hoverboard may shut down before a low battery warning is emitted so make sure you get a good feel for how long the battery lasts before taking it on any longer trips. Able to function on multiple terrain types. It can shut down without a low-battery warning. May not be simple for all people learning to use it. For a more kid-friendly option, the Halo Rover Hoverboard is friendly to lighter users so that they can get good practice in before moving up to a more serious option. 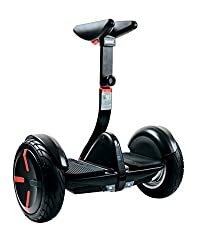 On the hoverboard market, these Segway models are quickly gaining popularity. Segways have long been devices popular to some, but largely remained devices that you might see on TV rather than in your home. Opposite to that, these newer models are some of the best hoverboards/electric scooters you're likely to find. Segways in general have been a larger cultural touchpoint in a lot of ways, including getting portrayed in a Weird Al music video. Furthermore, the MiniPRO is known to have a fantastic battery life and a convenient steering bar leveled at about the knee of the user. You'll be able to traverse about 14 miles on the miniPRO without the need to recharge it in the middle. The miniPRO is a powerful hoverboard option with 800-watt dual engines, which allows you to move along at 10 miles per hour without a problem. You'll also be able to use the Segway Bluetooth app to enjoy listening to music as you ride. It also pairs easily with your device, allowing you to connect and control the music. 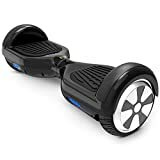 Amazon reviewers have loved this unit, claiming that the battery life, customization abilities and anti-theft security make it a better hoverboard than many other options. You'll also have LED lights and software updates that you can easily control, making it a truly fantastic overall buy. So when you're looking for an excellent hoverboard unit, don't count out Segway as a company. The MiniPRO is well worth a shot! If you try out this device, make sure to keep an eye on it and make sure it's charging properly and holding a charge. Great for making short trips to work. In some cases it may stop holding a charge. Some customers have experienced issues with customer support. If you want to be able to make longer trips without having to worry about the battery dying, then you should try out this option. TOMOLOO is known to be one of the best brands when it comes to self-balancing scooters. This hoverboard is UL2272 Certified so that you can trust it to be a safe machine. It's also inspected by the CPSC to give you the safety and guaranteed quality you want in this kind of product. Aside from adhering to strict safety regulations, the TOMOLOO also offers a weight limit higher than other models at 264lbs and a battery life that can last for up to 12 miles. You'll also get access to a great Bluetooth 4.0 system and 300 watt silent motors that allow the user to hear the music while they ride. Because it's self-balancing, the TOMOLOO is also a great option for kids, meaning that your son or daughter can enjoy it as much as you do. In addition, you'll easily be able to connect your smartphone to this model to listen to music and the fantastic RGB lights can help for making a great riding experience. This TOMOLOO is a great model and bound to offer plenty of pure fun to anyone using it. Just make sure that whoever is using it is careful if they're riding in the street or around other hoverboarders. The TOMOLOO has been adored by Amazon reviewers for it's speed and capability, so it's absolutely worth a look. One thing to keep in mind if you decide to purchase this hoverboard is that the Bluetooth speakers can become distorted in some instances. The Bluetooth speaker sound can become distorted. In some cases it can arrive in a damaged condition. If you're new to hoverboarding and want something easier to learn on then this is a worthwhile option! The manufacturers of the SagaPlay F1 have designed this self-balancing hoverboard with adults in mind. It comes at a slightly lower cost than other hoverboards and can work well for both adults and children, but is prized in this article for being great for young adults. It's also UL 2272 certified, so you'll be able to trust in the safety it offers. Due to a great battery life and powerful motors, this is truly one of the greatest hoverboard models. It comes with a Bluetooth speaker and advanced motor that can allow it to function in a number of ways, including twisting left, turning left, turning right, or whipping around in tighter circles as well as going forwards and backwards. This simpler, more affordable device can help you with getting from place to place without having to worry about a limit on safety or ability. In addition, you'll get everything you need to be able to make shorter trips to work or other places where you'd normally have to use up gas to get to in your car. Because of that, you'll be able to save a little money while you enjoy your new hoverboard. With a single charge, you'll get a 9 mile range from this device, which may be less than some models. However, aside from that this CSA/UL2722 Certified machine is great for traveling and handling inclines without a problem. Keep in mind that this is one of the heavier options as far as hoverboards go, so it may not be the best option for those who need to carry it often. Can be on the heavy side and more difficult to carry. In some cases it can shake while running. If you're looking for something heavy-duty that works great for young adults, take a look into the SagePlay F1. Whether you're looking for the perfect battery life, a high speed or a great Bluetooth speaker you'll surely find the best option from this list. For this article, the Hovertrax 2.0 sits at the top of the list due to it's excellent combination of features and price. Depending on what you're looking for, it will be important to keep different features in mind. Overall, remember that if you or anyone in your family is using a hoverboard outside, it's a good idea to wear a helmet and other safety devices to stay protected during any potential falls. In conclusion, remember that staying safe as you ride is just as important as looking cool.